Mark S. Carrow, CPA, Philadelphia managing partner of Citrin Cooperman, an accounting, tax and consulting firm, participated in the 51st Bob Hope Classic January 18-24, 2010, at La Quinta Country Club, Nicklaus Private at PGA West and Arnold Palmer Private at PGA WEST and SilverRock Resort. Carrow donated $9,000 to the event which will be donated to various charities. A tradition since 1960, the organization donated more than $1.5 million to charities at the 51st Classic and has contributed nearly $49 million to charity over the years. 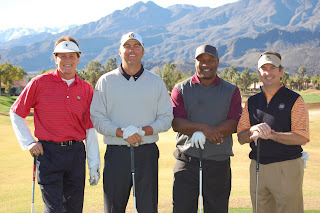 Pictured from left to right in the foursome are Bruce Jenner, Bo VanPelt, Bo Jackson and Mark Carrow. Carrow resides in West Chester, Pa. and is a graduate of Widener University where he received an M.S. in Tax and Walsh University where he received a B.S. in Accounting. How did Tiger Woods Do? Furia Rubel Ushers in 2010 on a Positive Note!